NOAA GRAPHIC – Satellite monitoring on Sept. 10 found a huge area of much warmer than normal surface temperatures in the Northeast Pacific Ocean. LONG BEACH — The Blob, a news-making patch of unusually warm ocean surface water from late-2013 through autumn 2015, was reborn this month. The ocean warmed quickly. As recently as July, “The northeast Pacific off our coast was slightly above normal, but nothing exceptional,” University of Washington meteorologist Cliff Mass noted Sunday on his popular blog. By Sept. 10, some limited areas of the nearby Pacific were 5.4 to 7.2 degrees F above normal, Mass noted, while satellite monitoring shows an enormous zone of overall warmth extending west from the coasts of Washington and Oregon, north to Alaska. News about the birth of this “Son of Blob” comes just as climate experts have officially declared this will not be a La Niña winter. The flip side of more-famous El Niño conditions that influenced the winter of 2015-16, La Niña is a pattern of unusually cold surface waters in the equatorial Pacific Ocean. It tends to result in wetter and cooler winter conditions here in the Pacific Northwest. On Sept. 22, the National Oceanic and Atmospheric Administration will issue its new 30- and 90-day long-range forecasts, and will try to determine how the Son of Blob will influence our weather in a winter with neutral El Niño/La Niña conditions. The short-term forecast for this week is for warm and generally pleasant late-summer weather on the coast, but critical fire weather conditions for parts of the interior. A result of a persistent zone of high atmospheric pressure in our part of the Pacific, the original Blob created “highly unusual weather,” according to Washington State Climatologist Nick Bond. Ocean conditions made their way onto dry land in the form of drought and record temperatures — “2015 was by far the warmest year we’ve had in the Cascades” and “Oct. 1, 2014 through September 2015 [was a time of] record warmth in much of the Northwest,” Bond said at the 2016 Pacific County Marine Science Conference in Long Beach on May 21. Widespread forest fires and possibly the largest documented seabird mortality event in world history were linked to the 2013-15 Blob. Mass said Sunday that experimental modeling he conducted found a modest 1 to 2 degrees F increase in land temperatures from the Blob. But even that amount of additional warmth can have a noticeable impact on snowpack and other terrestrial conditions in the Pacific Northwest. 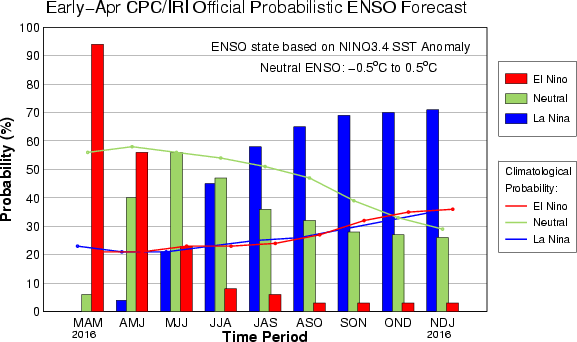 La Niña is El Niño’s cooler counterpart in the tropical Pacific Ocean. Whereas El Niño exhibits abnormally warm ocean temperatures and a strong atmospheric circulation across the equator, La Niña represents abnormally cold water. The cooler sea surface temperature pattern enhances the circulation in the tropics, called the Walker circulation. The Walker circulation tends to dominate the weather across the equatorial Pacific. Air flows west toward Indonesia, where water is typically the warmest, and rises. This creates lots of thunderstorms and rain. During El Niño, this circulation is disrupted. The warmest water sloshes to the eastern side of the Pacific near South America. Air ends up rising closer to South America, and it sinks over Indonesia. La Niña is the exact opposite. It sends the circulation into overdrive. In its forecast, Columbia University’s International Research Institute for Climate and Society has increased the likelihood of La Niña to 65 percent by early fall, and a 70 percent chance by next winter. This is up from 50 percent last month. NOAA will “declare” a La Niña when temperatures across the eastern side of the Pacific have cooled to a temperature departure of 0.5 degrees Celsius below normal, and when the Walker circulation strengthens like we would expect it to during a true La Niña.